“I denounce that the empire is deploying criminal strategies against the government of Brother Daniel Ortega,” Morales tweeted. 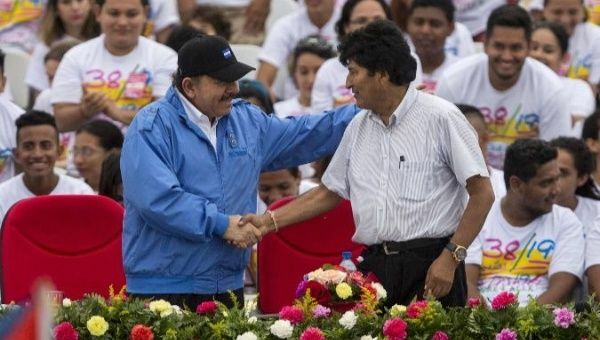 July 20 (teleSUR) Bolivian President Evo Morales condemned what he considered to be the United States’ “interference” in Nicaragua Thursday, denouncing the “criminal strategies” against the government of Daniel Ortega. “On the anniversary of the triumph of the Sandinista Revolution, I denounce that the empire is deploying criminal strategies against the government of Brother Daniel Ortega,” he wrote on Twitter. Morales also accused the United States Agency for International Development, or USAID, as well as the National Endowment for Democracy, or NED, of “openly supporting violence” in Nicaragua. Accompanying Morales’ message was a photograph commemorating the 39th anniversary of the “triumph of the Sandinista Revolution” in the Central American country. The protests began on April 18 due to failed social security reforms; however, they soon turned into calls for Ortega’s resignation.